Pit Barrel Cooker (PBC) Appreciation Thread - Page 503 - The BBQ BRETHREN FORUMS. Nice to see the Crimson and Cream making an appearance on the thread today! Go Sooners! Sounds like it should be cooked like a prime rib which is why your coming up with the 125-130° temp. As a KSU grad, I'll (begrudgingly) agree. Good luck in the playoffs! Yep. We talked about that when the announcement came out. Do you have one? We are hoping someone will get one and post a review! I hope that means what I think it means! Check out the PBC Appreciation Thread! I couldn't resist so I pulled the trigger. PBC is awesome and the apple (PBJ) doesn't fall far from the tree. Looks like an awesome little cooker. Woo hoo! Welcome back to the club! I seem to remember suggesting you get one! Poll nitpickers are never happy unless they have a nit to pick with a poll. Never really planned on leaving but I suppose I'm "officially" back Bob. 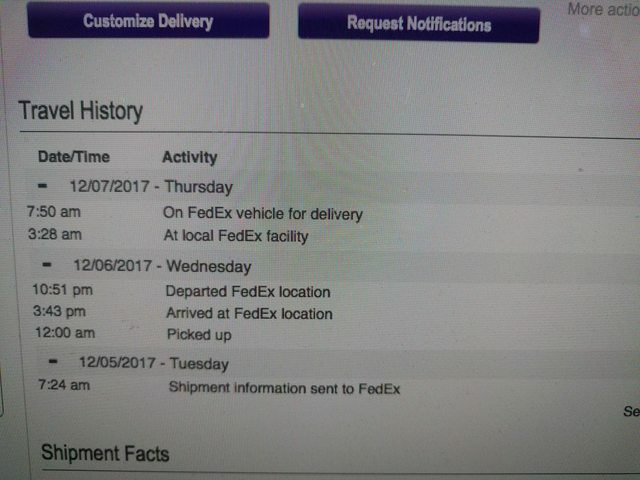 A bit of a bummer, looks like FedEx postponed the delivery date. Now delivery date reads unavailable but totally understandable since I'm surprised they're working through this mess anyway and managed to deliver a package this AM already. Seriously Sako??? Is the Hunsaker really that much more work than the PBC was that you needed a PBJ??? PBCAT was buried too far out. Resurrection time. Of course not but I had to formulate a reason in my head to buy a new cooker. Well that makes some sense....although the Hunsaker is still pretty new too...right? I guess FedEx doesn't have that 'neither sleet, nor snow, nor fire' clause in their mission. Waiting for unboxing and first fire up posts.